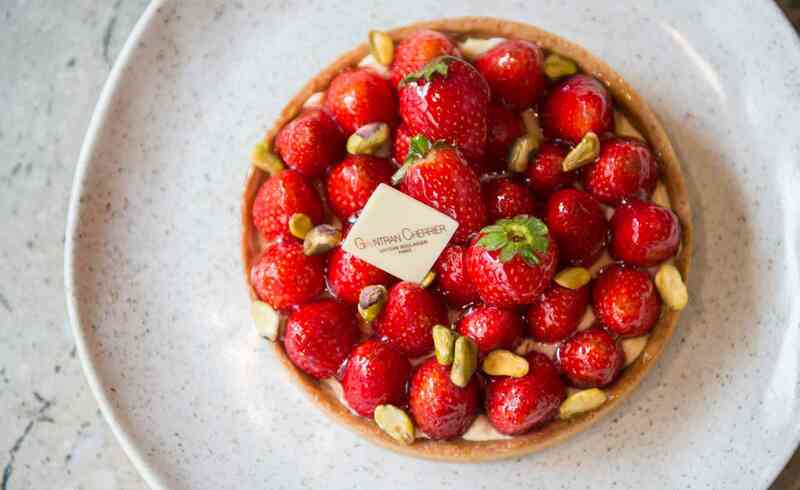 French chef, Gontran Cherrier, shares his berry-licous Strawberry Tart recipe with us. For those lucky enough to live in Victoria, you can experience his authentic French pastries and bread for yourself at his Collingwood Boulangerie. In a mixing bowl, gently cream the butter at room temperature with the sugar. When smooth, add the egg.Mix gently until well combined. Then add the flour and continue mixing on low to avoid adding air into the dough.For best results, prepare the dough one day before and keep it in the fridge (it can also be preserved in the freezer for up to 1 month).The following day, roll until 2/3 mm thick, then with a fork, mark the dough evenly (this will help the air to escape while baking).Grease your 16cm tart ring lightly with butter or oil spray. Place the tart on a baking tray, lined with baking paper.Bake at 160 ˚C /170˚C for about 10 minutes.Remove from the oven, then gently brush with a thin layer of egg wash, return the tart for 3 to 4 minutes (temperature and baking time may vary with your oven, adjust if required).We’re looking for a golden tart colour. Add the milk, half the amount of sugar and the vanilla pod into a saucepan and bring to the boil. Be sure to scrape the seeds. Once milk begins to boil, let it cool down for a minute, then remove the vanilla pod and scrape it again. Place back on the stove. In the meantime, in a separate bowl, combine egg yolk and sugar, and mix. When well mixed, add the corn flour. When milk is near boiling, add half the amount of egg yolk mixture. Mix until well combined, then add to the milk left in the pot. Mix well until it thickens. Let it boil for 3 minutes, stirring the whole time. Remove from the stove and add the butter, then mix well. Gladwrap a plate, then pour the custard cream onto the plate, cover this with another layer of gladwrap, straight into contact with the cream to avoid any skin forming. When cold, measure the amount of cream you obtain. In the mixing bowl, add 50% of cream, then whip. Using a plastic spatula, gently mix the custard cream until smooth. When the cream is whipped, gently fold with the custard cream until well combined. *The cream can be made the day before. Fill a piping bag with the diplomat cream and pour the cream evenly into the tart base. Cut fresh strawberries and arrange on top of the tart.